Head coach Jeff Walz has his USA Team 2-0. Ariel Atkins chipped in eight points. USA assistant coach Courtney Banghart talks with Kalani Brown. Monique Billings produced five points and five caroms. Kalani Brown added six points and five rebounds. Jordin Canada had nine points and five assists. USA assistant coach Michelle Clark-Heard talks strategy with Monique Billings. Asia Durr put up eight points and had a pair of assists. Linnae Harper looks to shoot over her defender. Sabrina Ionescu drives to the basket for two of her 10 points. Shooting a perfect 7-of-7 from the field, Brittany McPhee finished with 15 points. Kelsey Mitchell had nine points and three assists. Jaime Nared scored six points and grabed four rebounds. Arike Ogunbowale went off for a game-high 17 points. Marcedes Russell goes up for two of her five points. She also had six boards. 2018 USA U17 Women are Golden! Atlanta Hawks head coach Lloyd Pierce was named to the USA Basketball Men’s National Team coaching staff. Pierce replaces Indiana Pacers head coach Nate McMillian who withdrew because of scheduling conflicts. 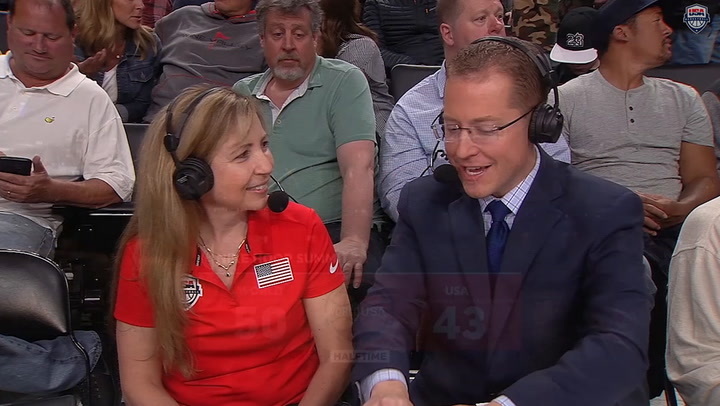 Professor of Orthopedic Surgery Doctor Diane Dahm of the Mayo Clinic talks about working with USA Basketball's Junior National Team. Jeff Walz, Natasha Adair and Cori Close will return to guide the 2019 USA Basketball Women's U19 World Cup Team. A veteran of 12 NBA seasons and three USA Basketball teams, Shareef Abdur-Rahim is passionate about the development of young American players. Exactly what is the FIBA Americas U16 Championship? How have past USA teams fared? Who are some of the stars who have played in past U16 tournaments? Find out here. © 2019 USA Basketball. All rights reserved.